In a solo exhibition of recently made sculptural paintings, drawings, and photo collages by Susan Weil at Sundaram Tagore Gallery, the artist demonstrates a deft, yet bold approach to form and content while confronting time and art history, all while maintaining poetic elegance and keeping visual harmony. Weil, a peer of both Elaine and Willem De Kooning, Cy Twombly, Jasper Johns and Robert Rauschenberg, continues to experiment with perception of space through dimensionality, material manipulation and rearrangement. 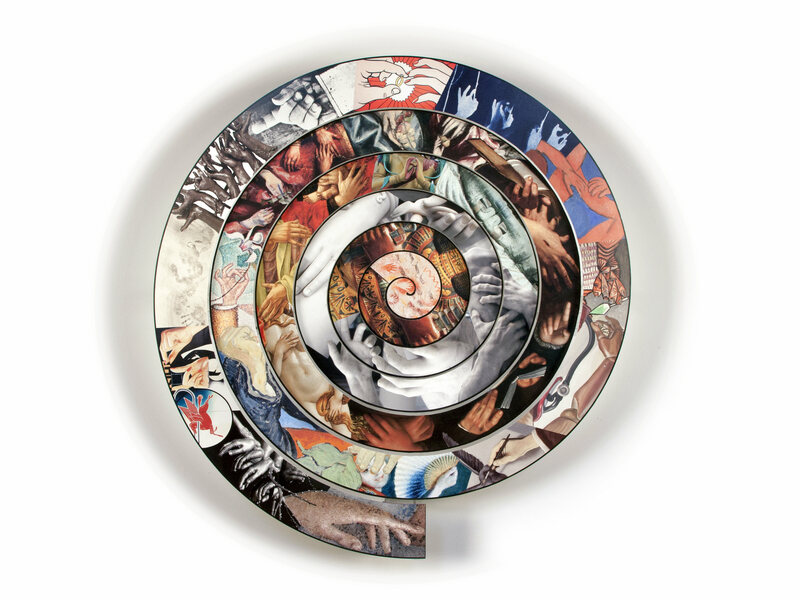 In Spiral History of Art with Hand: Cave Painting to Now, (2016) Weil takes various depictions of hands from different points throughout the western painting cannon, photoshops them into a quasi-chronological spiral, prints it, then mounts it on aluminum. With the center of the spiral closest to the wall, each outer spiral inches closer toward the viewer. With this simple gesture, Weil lays a backdrop for the whole exhibit by posing questions about our perception of space and time, but also a visual backdrop by utilizing hands, one of the main recurring motifs, as the centerpiece of the work. Another method of breaking the picture plain is employed in what one could consider either sculptures or drawings. “Hand in Hand,”(2017) “Torso-so,” (2017) and “Awing,” (2017) are all simple representations of a hand, torso, and a bird, respectively. Using flexible poplar plywood, Weil outlines the representations and cuts only a part of the outline, causing the part of the drawing that is cut to pop out when the rest of the plywood is flexed. To see an artist like Weil, who has had a career spanning six decades still taking risks and venture into unexplored areas of drawing and sculpture, especially in an era where so many artists have subscribed to a formula that is safe and non-threatening, is uplifting. But the boldest piece of the exhibition was “Leftovers,” (2015) a digital print of what is barely recognizable as Da Vinci’s famous painting, “The Last Supper.” mounted on aluminum. Weil strips the painting of everything else but the loose outlines of the disciples but leaving their hands as is in the original. She also outlines the windows and walls, focusing in on what is perhaps the most widely used example of one-point perspective in art. She further emphasizes this perspective by cutting the substrate, the aluminum, in the shape of the two side walls stretching towards the back, and folding the side walls so that in addition to the illusion of a perspective, an actual sculptural perspective is forced upon viewers. Weil jokes that this was in a way a collaboration with the master painter, that he brought supper, and she made the leftovers. During the opening, I approached her to congratulate Susan Weil on a stellar exhibition. When I did, she remarked “I can’t stop thinking ‘what a privilege it is to dedicate a life to art.’” The dedication shows itself through her skillful manipulation, but her sentiment about art is something beyond words that can perhaps be seen through how Weil approaches her work at times with audacity, and during others with wit and humor. “Susan Weil: Now and Then” is on view at Sundaram Tagore Gallery located on W 27th Street in Chelsea, New York until July 8th. Jongho Lee is Eyes Towards the Dove’s Editorial Assistant. His writing appears here and he is also a studio art student at New York University, Steinhardt School of Education.